This week we present Leath Sheales’ Unity, the opening fiction to Trinity Continuum: Æon, currently available for preorder via BackerKit. The room beyond the open door was minimalist, but spoke volumes about Nippon. The desk to the left appeared to be molded from a single piece of unknown material. Its writing surface washed gently with images of waves against the shores of the Home Islands. To the right was a couch and two single lounges, all arranged around a low coffee table that appeared to be a younger sibling of the desk. Both the desk and the lounge setting were arranged facing each other, with the entrance on one side and window on the other. The man who inhabited the office could easily turn his head to see the UN building’s inspiring view of Olympus and upwards to the sky where Earth glittered like a multi-hued jewel. He could stare straight ahead, ordering the wall to transform into a single massive vidscreen to show whatever he wanted. Or he could see who was entering his sanctum. As he was doing now. Amina, rather than entering, was staring at his personal assistant who was standing beside the doorway, gesturing her through. She studied the assistant’s face carefully, leaning in close for detail. The assistant stared back at Amina with a pleasantly neutral expression. She took no offence at the scrutiny; part of her purpose was to invite it. The man in the office also took no offence, but did shift slightly with impatience. Amina saw this from the corner of her eye and took the hint. She walked through the doorway, moving to the lounges; the man gestured for her to do so and stood from his desk to join her. Yamashita Sachi threw herself around the corridor’s corner so quickly that she tracked wide and bounced off the opposite wall. The collision twisted her balance, forcing her to make several quick shuffling steps to keep from falling over. Her shoulder ached from the impact. Sachi grinned at the thudding pain down her arm and the increasing burning from her lungs. Pain meant life. She was still alive, despite the seemingly endless run of bad luck she’d experienced on this job. Catching her balance had slowed her momentum. She didn’t have time to rest — the clock ticked onwards despite her success or failure — so she turned the scrabbling steps into purposeful bounds, driving her legs like pistons against the cold metal floor, forcing herself onwards. Sachi had a small but powerful build. The combination of dense muscle and short limbs gave her natural leverage that she used mercilessly whenever opponents underestimated her. It also meant that she had to push twice as hard to outpace larger, leaner opponents. Though she was physically fit — beyond fit — she panted as she ran. Her fitness came from growing up in the officially unpopulated sections of the Nippon arcology. She did what was needed to survive and avoided the authorities when they deigned to acknowledge these areas of the city existed at all. Her natural aptitude was greatly magnified after she escaped Nippon and was found by the Vitakinetic Order. The Prometheus Chamber transformed gifted human into perfection. The shoulder ache persisted, which told her she’d incurred a heavier injury than simple bruising. It would have been a moment’s effort to know exactly how she was damaged, and probably not much more to repair it, but she didn’t want to waste the time. Even before her training she would never bow to pain, refused to let it be her master. She found the location she was searching for deep within the abandoned sections of Nippon. With her senses pushed beyond normal human limits, her keen eyes picked up traces of booted feet on the floor. She smelled faint traces of antiseptic chemicals and human sweat. The corridor ended in a hatchway guarded by a crablike, many-armed drone. Sachi increased her speed and tackled the robot, using her momentum to tumble both and forcing a moment of confusion too difficult for the machine’s mind to calculate. Her right arm kept her body tight to the robot while her left grabbed a retractable cable protruding from the pocket on her thigh. She worked to shove the plug into the bot’s hardware I/O port before it worked out enough to send a wireless distress call. She’d been trained in physical guerrilla hacking by some of the best Nipponese outcasts food could bribe, and had practiced the art more times than anyone should. The crab kicked out, trying to regain control, knocking her hand out of the way, but she twisted and brought it down again, altering her grip and position to avoid being crushed under its chassis. She snagged the plug into the socket on the third try and slapped at the minicomputer in her pocket. The scramble code was uploaded in microseconds and the maintenance drone twitched and scrabbled in pathetic machine distress as its brain dumped into an endless loop executing meaningless commands. Sachi lay on the ground for a moment longer, allowing herself to breathe and smile at her success. Celebration was short-lived; time was wasting and she heard the staccato march of reinforcements. Either the drone had managed a distress call or she hadn’t lost her earlier pursuers as she’d thought. She rolled into a seating position and grabbed a miniature pry-bar from another pocket. The bar made short work of the door’s access panel and she had the minicomp’s cable into the port before the panel clattered to the floor. Amina waited patiently while the robotic assistant served tea. Nakamura wore an expression of forced calm, though flashes of extreme worry and anger crept through. Though she didn’t make a show of it, Amina watched every micro-expression carefully. She was developing an understanding of the man, even in the silence. Finally, the servant finished pouring and left, closing the door behind her. Nakamura couldn’t completely mask the slight tremble as he took a sip from his cup. “As I said, Ms Buhari, I have no need of your assistance,” he said. She heard the lie, and even the hint of desperation in his voice. He wanted her help, but he needed to be persuaded. “Let us speak frankly, Mr Nakamura,” she said, her voice confident and reassuring, “We know that your daughter, Yuna, was kidnapped while vacationing in Makaro-Shima. We know that the kidnappers told you not to contact anyone, and we know they forced you to use your position to pass hardtech designs to them.” She paused and sipped at her tea. A tiny signal of hope penetrated the cocktail of confusing emotions Nakamura struggled to keep under control. “What do you need from me?” he asked. Amina smiled and nodded her head encouragingly. Everything about her said that they were partners in this, and that she and Nakamura had bridged the distrust for the greater good. Jack cast a critical eye over the room. This work was normally Sarah’s job, but she had tasks elsewhere. Obtaining the information they needed had fallen to Jack, and he was doing what he did best — improvising. He looked at the man hooded and bound to the old-fashioned chair in the center of the basement room, and to the semi-circle of holodisplays a few feet beyond. Jack kept the room dimly lit for his own benefit. His captive wore a blindfold that looked like a pair of antique aviator goggles. The biotech kept a firm seal around the eyes, to keep moisture out while wicking away tears that could lead to condensation on the inner lens. Though originally made to help neutrals visualize the myriad energy wavelengths that suffused the world, they had another setting that Jack was using now. Complete blackout. Not even a stray photon could pierce the biotech/skin bond until Jack allowed it. When possible, Jack preferred to work in darkness. Bright lights just added a jumble of chaotic wavelengths that he had to filter out and ignore. Jack moved around the room, adjusting the position and angles of several screens once more. He went back to the man, pivoting left and right to check that the screens were precisely where he wanted them. Finally, Jack nodded his head, satisfied. With the tiniest flicker of concentration, Jack tapped into the ever-present wireless signals and checked the time. He sighed. He needed the man to be awake for this. For a moment, Jack toyed with the idea of sparking tiny pulses into his amygdala to increase the chance of provoking weird, terrifying dreamscapes. He decided against it. He wasn’t a torturer, although the man didn’t need to know that. The man jerked awake, moving his head in blind confusion and unconsciously testing his bonds before he even realized he was restrained. He tried to yell his distress but only muffled grunts made it past the gag across his mouth. More biotech. Almost complete silence, and it monitored the captive’s vitals to ensure they received enough oxygen. “Hey, Mr Williams, good morning,” Jack said, though it was just past 8 in the evening. Jack wanted to increase the man’s confusion, the worry at what had happened in the lost hours would help cut his resistance. “Here’s what’s going to happen. I’m going to show you images, ask some questions, and you’re going to do your best to answer them.” More muffled attempts at speech. “No need to talk,” Jack continued. He stood close to Williams and placed his hand on the man’s head. Williams tried to shake Jack’s hand away, but his bonds held tight. Jack pursed his lips and frowned in concentration. “That’s it,” he murmured, “Just relax and this won’t hurt a bit.” Crawling sparks played across Jack’s hand, jumping excitedly to Williams’ scalp. Williams’ hair stood from his head as it charged with static electricity. Jack shifted his fingers and narrowed his eyes as he psionically pushed. He felt some resistance — unexpected, intriguing — and shoved. Williams grunted against the sudden alien feeling. “Fighting makes it worse,” Jack murmured. He gestured to the surrounding screens with his free hand and several flared to life. Garbled, static-filled signals filled them. They may have been people or places, but were too broken to tell. Jack saved them anyway for later analysis. Jack tapped the biotech lenses, commanded them to project images. “Now,” he said, “Recognize that place?” Williams saw a picture of his home, and several of the screens flared in recognition. Neural networks fired tiny electrical fireworks, racing across the brain. Jack’s fingers picked up the faint pulses. He couldn’t understand them — he wasn’t a telepath — but he could translate mental impulse into electronic signal through his psi. Jack noted the positive response and adjusted his fingers for a clearer signal. “How about this?” The image changed to Williams’ wife and children. Another positive, with more of the peripheral screens flashing with what Jack recognized as stress. “Good. Cooperate, and they’ll be fine. If not,” the images vanished from the lenses. More stress response. “You and your associates like to kidnap people for money.” Jack fed images through the lenses, too fast for Williams’ conscious mind to register them all, but his subconscious surged with a mix of signals. He recognized some, but not all. “One of those people was a young woman from Makaro-Shima.” Another image and recognition response. “I want to know where she is,” Jack said. The lenses rapid-flashed images of different cities. Jack watched for positive responses and honed in on suburbs and locales. Williams struggled, trying to avoid giving away what he knew. The biotech lenses revealed Williams had closed his eyes. Jack curled his fingers and held Williams’ hair uncomfortably tight. He resisted the urge to hurt the man. Though Jack hated Williams for what he did, kidnapping was as close as Jack would come to emulating him. Nakamura looked increasingly wretched. His façade of control had crumbled. He shook his head. “I don’t know,” he said. A lie, and one that Amina spotted easily. Amina nodded, “That’s good, Mr Nakamura, thank you.” She knew there was more information to be had, but she was patient. As upset as Nakamura was, he wasn’t a stupid man. He knew more than he was willing to say. Amina had time to work on him, to painstakingly draw the details out until she had the full picture. Olivia stood at the computer terminal, mentally ticking through the instructions Sachi had provided, to access the command structures and take the corrupted files she’d provided. Olivia had a basic knowledge of hardtech operating systems but she lacked Sachi’s expertise. The display changed as Sachi had said it would and Olivia slotted the storage device into its socket. Though she faced the terminal, she wasn’t looking at it. Her head was cocked slightly to one side and her eyes were glazed with a faraway look. She straightened and backed away from the terminal. A security guard opens the door, considering the control room. He thinks he heard something, and as far as he was aware, no one was scheduled to be working in here now. He can see most of the room from the doorway, and he can see one of the displays is active, running activity. He scans to the left of the room first, leaving his right side exposed. Olivia pounced from the guard’s blind spot, grabbing his arm and dragging him into the room in a spinning motion designed to keep him off balance. As he stumbled she hooked her leg behind his and pushed his chest, sending him crashing to the floor. She quickly turned and shut the door to muffle any noise that could warn others. The guard lands heavily, still unsure what was happening. Scrambling backwards, he grabs at the holstered pistol on his hip, drawing it and shooting at his unknown assailant’s back. Olivia stepped to the right and ducked, as the laser’s beam burned a small, circular hole into the door. She dropped her left knee and rolled back in the opposite direction. The rapid changes were quicker than the still-shocked guard could track. He burned two more holes in the walls before Olivia was on top of him, striking quickly at his throat. He dropped the gun and gasped for air as she slid around behind him, locking him in a choke hold and pushing his head forward with her body to increase the pressure. He fell unconscious within moments. Four minutes and 38 seconds after the scuffle, a routine patrol discovers an unconscious body on the floor of the control room. The guards quickly place the facility on alert and corner the intruder. She’s injured, but captured alive. Eventually she breaks under interrogation and reveals what she knows. By the time anyone comes looking, the illegal aspects of the operation have moved to a different location. The terminal chimed in completion as the files finished installing themselves. Olivia grabbed the storage device and tucked it back into her pocket. She frowned and concentrated, sifting through the myriad potential futures, searching for the best outcome. In four minutes and 38 seconds, a two-person patrol checks the control room. They miss the young woman who left the room minutes before, struggling to carry an unconscious guard in a fireman’s lift. They continue their patrol. Though they give the nearby washroom a cursory glance, they don’t think to check the cubicle farthest from the door where the woman holds the unconscious guard propped up on the toilet. They close the door and continue their circuit. The woman cuffs the guard with his own equipment and makes an impromptu gag from the torn sleeve of his shirt. When he is found an hour later, the woman has already escaped the building using the ceiling crawl space. The changes to the computer system aren’t discovered until it is far too late. Olivia sighed and grabbed the guard’s arm, hoisting him up and lowering her shoulder to carry his heavy form. It was time to leave. Amina took a minicomp from her bag and gestured to the wall. “May I?” she asked politely. Nakamura nodded and her Agent connected to the display. 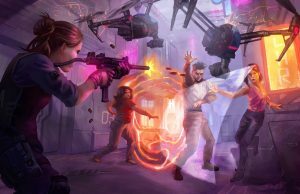 She sent several images across, some showing an illicit hardtech production facility, others showing a young woman missing her right hand being helped into an ambulance to be taken for medical treatment. “I don’t understand,” Nakamura said, tears welling in his eyes. Amina brought up other photographs. “We believe you do, Mr Nakamura. These show you meeting with the people who ‘stole’ your data. They were your business partners, were they not?” Nakamura shifted uncomfortably in his seat. He called for his assistant via cybernetic implant and was dismayed that she didn’t respond. Amina stood as the door opened and UN police entered, arresting Nakamura for his part in the criminal conspiracy. His expression turned from shock to fury. “Come on, come on,” Sachi muttered as the door resisted her hacking. The door had its own minor Satisfactory Intelligence that didn’t want outsiders getting in — or insiders escaping. The SI’s firewall and countermeasures pushed back hard. Sachi pumped everything she had at the command systems, peeling back layers of control code, smashing the sides of peripheral awareness subroutines, searching for some way in. Frustrated, she grabbed her pry-bar again and wedged it into the side of the door. She pushed hard, leveraging her entire body against it. She knew whatever additional security Nippon was going to throw at her would arrive soon. Metal screeched in protest and the door budged a fraction. Sachi released the tension, took a breath, and flooded psi throughout her body. Bone density and muscle mass grew in seconds. Her skin rippled and bulged with the sudden increase. The fabric of her smart clothing resisted for a moment before relaxing fibers to meet new requirements. She grabbed the pry bar and pushed again, this time her efforts reinforced by the sub quantum universe. The door moved further, opening a small gap between hatch and frame. The pry bar snapped. Sachi dropped the useless metal and drove both her hands into the gap, grinding her teeth together and pushing herself beyond her known limits. The first droid rounded the corner. It was an old police interface model and looked mostly human, except for the perfect neutrality of its facial expression and the cold, dead eyes that saw Sachi. The lighter unit was slightly faster than bulkier models, and it blocked the path of the two clearance-and-destruction units that tried to round the corner behind it. Its original programming could barely have taken this situation into account, and the modifications made by the criminals who acquired it had slowed its processes. It sought additional instructions and that bought Sachi a few valuable seconds. The door finally gave, snapping open and surprising Sachi. Her additional force threw it open so hard that it slammed back against the wall, denting it and twisting its hinges. Sachi ducked inside and saw the combination hospital/laboratory/prison beyond. Dozens of malnourished, mistreated people lay strapped on wheeled beds. Some were barely conscious from whatever drugs the IV lines attached to the beds flooded into them. Others were barely alive, having been repeatedly subjected to hideous experiments. Two android nurses patrolled the room, ensuring none of the test subjects died before every scrap of data had been gleaned. Every victim wore a psi-inhibiting collar, keeping them from using their abilities except as their captors demanded. Rather than immediately rushing to help the victims, Sachi scanned the room carefully, trying to ignore the noise of the security robots as they reached the twisted doorway with lethal intent. I’m here, do you have what you need? She shouted silently with her thoughts. Incoming, Sarah’s reply echoed inside Sachi’s head. With a sharp buzz, a glowing circle flared to life to her left, and through it another room became visible. Five people hurried through it. Sachi felt Sarah’s mental link take hold and her brain processed the room from multiple angles, mingling her sensory input with the rest of her team. As soon as the team arrived, Sachi ignored everything else and rushed to the teleporter. Rahmat knew what she wanted through the psionic link and held his hands outstretched to take hers. Their subquantum signatures mingled as the two psions combined their powers. To the Vitakinetic, each living template was distinct. To the teleporter, all space was one. Sachi pushed her healing though Rahmat and out into each victim at once. The effort was immensely draining, compounded by the reserves Sachi had spent opening the door. She slumped as her power faded, satisfied at the increased strength of life she could now feel within the room. Rahmat still held her hands — he needed the continued strength and sense of life — and steeled himself as he prepared to teleport everyone out and to safety. The robots tried to react to the new situation but Jack worked faster. Lightning exploded from his hands, forking and jumping from robot to robot, overheating and melting their circuits. The lighter units simply stopped, their servos locked up. Instant emulated rigor mortis. The combat models seized for a moment, but they were built to withstand such attacks and their artificial brains kicked in redundant pathways while they rebooted primary function. These backup functions couldn’t keep Olivia at bay as she pressed the attack with pistol and taser in hand, not waiting to see the outcome of Jack’s assault. She already knew. Standing back from the violence, Amina reached out and took the hand of the nearest ‘patient’. “Who are you?” he asked, feeling stronger than he had in weeks. The air shimmered as Rahmat phased everyone out of the physical universe and translated them into subquantum particles. 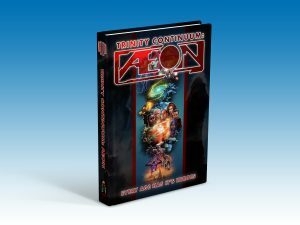 Trinity Continuum: Æon and the Trinity Continuum core rules are currently available for preorder via BackerKit.